The Pilgrims' psalmbook, the Amsterdam 1612 edition of Henry Ainsworth's Book of Psalmes. The Pilgrims strongly believed that the Church of England, and the Catholic Church, had strayed beyond Christ's teachings, and established religious rituals, and church hierarchies, that went against the teachings of the Bible. This belief put them at odds with church officials, who in the early years of King James I tried to have them arrested and thrown in jail for refusing to participate in church rituals. For this reason, many of the Pilgrims fled to Leiden, Holland, where there was religious freedom. However, the Pilgrims had difficulty adjusting to the more permissive Dutch culture, and had difficulty supporting themselves financially. In Leiden, the Pilgrims' church grew as additional people fled from England. The church pastor was John Robinson. Their church was created around the model of the "ancient church" described in the New Testament, so they had a Church Elder (William Brewster), some deacons, and a deaconess. They strictly honored the Sabbath by not performing any labor on Sunday. They studied the writings of earlier Protestants and Separatists, such as Martin Luther and John Calvin, and they even established a printing press to illegally distribute new Separatist and Puritan books in England. To the Pilgrims, there were only two sacraments: baptism and the Lord's Supper. The other sacraments of the Church of England and Roman Catholic church (Confession, Penance, Confirmation, Ordination, Marriage, Confession, Last Rites) were inventions of man, had no scriptural basis, and were therefore superstitions--even to the point of being heretical or idolatrous. The Pilgrims opposed mass, and considered marriage a civil affair to be handled by the State (not a religious sacrament). Icons and religious symbols such as crosses, statues, stain-glass windows, fancy architecture, and other worldly manifestations of religion were rejected as a form of idolatry. They also rejected the Catholic and Anglican Book of Common Prayer, believing that prayer should be spontaneous and not scripted. The Pilgrims' views against scripted prayer are laid out in church-member Sabine Staresmore's book The Unlawfulness of Reading in Prayer (Amsterdam, 1619). The legitimacy of the Pope, the Saints, bishops, and the church hierarchy were rejected, as was the veneration of relics. The church of the Pilgrims was organized around five officers: pastor, teacher, elder, deacon, and deaconess (sometimes called the "church widow"). However, none of the five offices was considered essential to the church. The Pastor was an ordained minister whose responsibility was to see to the religious life of the congregation. John Robinson was the pastor of the Pilgrims, but was never able to get to America before his death in 1625. The Teacher was also an ordained minister who was responsible for the instruction of the congregation. The Pilgrims apparently never had anyone to fill that position. The Elder was a lay-person responsible for church government, and he was also the church's eyes and ears, assisting the Pastor and Teacher in admonishing the congregation. William Brewster was the Elder for the Plymouth church. The Deacons collected offerings, and attended to the needs of the poor and elderly. John Carver and Samuel Fuller both were deacons during their life. The Deaconess attended the sick and poor, and often played the role of midwife for the congregation. The Deaconess of the early Plymouth church is not named, but may have been Bridget Fuller. 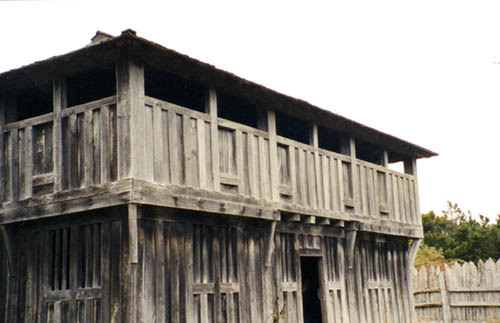 Reproduction of the Pilgrims' fort, which also functioned as the colony's church. The church building itself had no significance to the Pilgrims, and was kept intentionally drab and plain, with no religious depictions, crosses, windows, fancy architecture, or icons, to avoid the sin of idolatry. At Plymouth, the Pilgrim's church was the bottom floor of the town's fort--the top floor held six cannons and a watchtower to defend the colony. The church room was also the town's meetinghouse, where court sessions and town meetings took place. Isaac de Rasieres, who visited Plymouth in 1627, reported how the Pilgrim's began their church on Sunday: "They assemble by beat of drum, each with his musket or firelock, in front of the captain's door; they have their cloaks on, and place themselves in order, three abreast, and are led by a sergeant without beat of drum. Behind comes the governor, in a long robe; beside him on the right hand, comes the preacher with his cloak on, and on the left hand, the captain with his side-arms and cloak on, and with a small cane in his hand; and so they march in good order, and each sets his arms down near him." During the early years of Plymouth, failing to bring your gun to church was an offense for which you could be fined 12 pence. The Pilgrims believed baptism was the sacrament that wiped away Original Sin, and was a covenant with Christ and his chosen people (as circumcision had been to God and the Israelites), and therefore children should be baptized as infants. This was in opposition to the Anabaptists, who believed that baptism was essentially an initiation ceremony into the church-hood of believers, and therefore could only be administered to believing adults who understood the meaning of the ceremony. The Pilgrims, on the other hand, believed that "baptism now, as circumcision of old, is the seal of the covenant of God," and they felt that groups like the Anabaptists who did not baptize their infants were depriving Christ's flock of all its young lambs. Richard Clyfton, one of the founders of the Pilgrims' church, even published a book on the topic, A Plea For Infants (Amsterdam, 1610). They further believed that at least one parent must be of the faith for the child to be baptized into the church. The Pilgrims faithfully observed the Sabbath, and did not work on Sunday. Even when the Pilgrims were exploring Cape Cod, they stopped everything and stayed in camp on Sunday to keep the Sabbath. The Pilgrims did not celebrate Christmas and Easter. They believed that these holidays were invented by man to memorialize Jesus, and are not prescribed by the Bible or celebrated by the early Christian churches, and therefore cannot be considered Holy days. "It seems too much for any mortal man to appoint, or make an anniversary memorial [for Christ]," taught the Pilgrims' pastor John Robinson. The book Perth Assembly (Leiden, 1618)--the book that got Elder William Brewster into such hot water with the King of England and ultimately resulted in the confiscation of his printing press--was largely about the rejection of Christmas and other appointed "Holy Days." The Pilgrims considered marriage a civil affair, not to be handled by the church ministers, but instead by civil magistrates. Marriage was a contract, mutually agreed upon by a man and a woman. Marriage was created by God for the benefit of man's natural and spiritual life. Marriages were considered important for two main reasons: procreation of children to increase Christ's flock; and to avoid the sin of adultery. Pastor John Robinson taught that the important characteristics to find in a spouse are (1) godliness, and (2) similarity--in age, beliefs, estate, disposition, inclinations, and affections. In the marriage, "the wife is specially required a reverend subjection in all lawful things to her husband," and the husband is "to give honor to the wife," as the Lord requires "the love of the husband to his wife must be like Christ's to his church." The Pilgrims refused to include religious symbolism in a marriage ceremony, including the exchange of wedding rings, which they considered a "relic of popery" ... and "a diabolical circle for the Devil to dance in." The Pilgrims used the Geneva edition of the Bible, first published in English in 1560. The translation and footnotes of the Geneva Bible were made by early Calvinists more trustworthy to the Pilgrims than the later King James Bible (first published in 1611) whose translation and footnotes were written by the Anglican church hierarchy. The Pilgrims only sang actual Biblical psalms, they did not believe in singing hymns that were not direct Biblical texts. Henry Ainsworth, of an English separatist church in Amsterdam, wrote the psalm book used by the Pilgrims. They believed it more accurately translated the Biblical Psalms into verse than other psalm books. The Pilgrims believed the Apocrypha was worth studying as religious texts, but were non-Canonical. For religious interpretation, the Pilgrims read a lot of books, and thankfully the early probate records of Plymouth Colony often give us the actual book titles owned by the deceased at the time of their death. Elder William Brewster had several hundred books on various religious topics in his library. The two most popular books in early Plymouth were John Dod's Exposition Upon the Ten Commandments, and their own pastor John Robinson's book Observations Divine and Moral. Also popular were the works of Henry Ainsworth, William Perkins, and John Calvin; as well as John Foxe's Acts and Monuments of the Martyrs, and Thomas Wilson's Christian Dictionary. Lesser known works that were popular in early Plymouth include Thomas Brightman's The Revelation of Saint John, and Richard Rogers' Seven Treatises Containing Such Direction as is Gathered Out of the Holie Scriptures, Leading and Guiding to True Happines, Both in this Life and in the Life to Come.